I have been working on a number of art projects for clients over the last little while with the weather being so unusual for this time of year. Upon working on these projects, I realized that I don’t have an area on my blog to refer clients to for inspiration anymore as it was blown away this year with the transfer. So I have decided to recreate the series on wall art. I will be sure to update links on Pinterest and will have a board there with my projects specifically. I will also have a category here (“wall art”) so that it is easy to find. For those of you that have been with me for awhile, you know I love art…and particularly different ways to display photos. The studio has a number of pieces that I have sourced that offer unique media (metal and acrylic and wall clings) as well as the classics (frames and canvas). Although I love art, I still have a minimalist perspective. I don’t think that you should fill all of your walls with just one session. Images from one chapter won’t truly capture your story so I love to build over time to tell the whole story. Also I really feel that the art purchased should be functional for you and your lifestyle. The last thing that I want is for pieces to end up in a landfill. So consideration’s given to how often you move (and if they will work in a variety of spaces) or if you are in your forever home (and we can do very specific designed pieces). Whether or not you have a lot of wall space or if you need a classic frame where images can be easily changed out. As I go through and share projects from my house and client’s houses, I will be showcasing art done through me and DIY projects. I know that many of my clients have an eye and an interest in doing their own…whereas others do not have the time or interest so I get to help them. I support both types of projects because I just want you to use and enjoy your images:). I placed these frames in a client’s house earlier this year. She had originally been thinking of canvas for this space but as we got talking realized that she would probably want to change them out so frames would allow this to happen easily (and without waste). 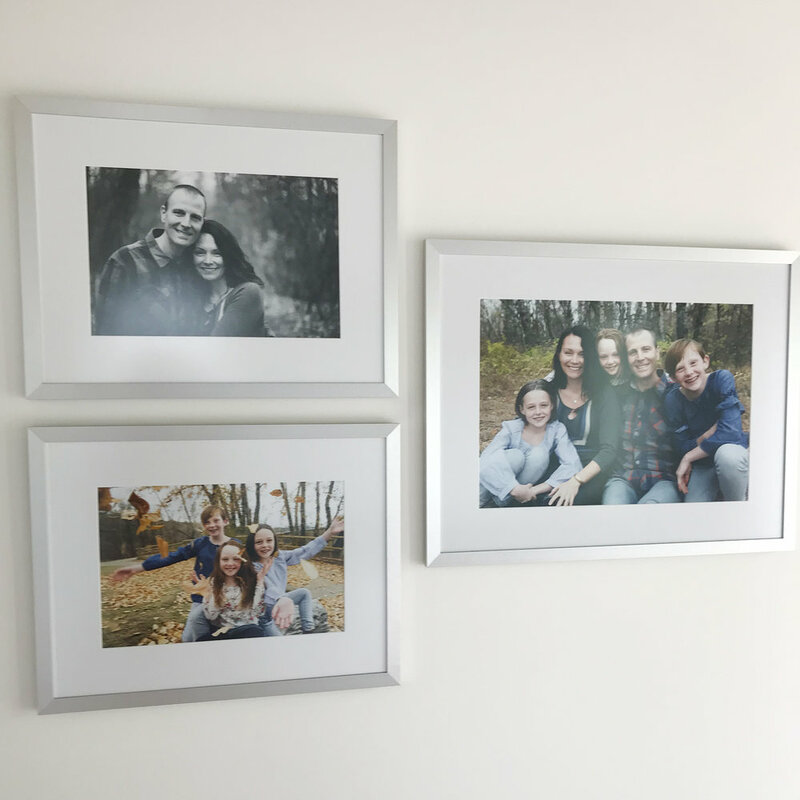 This is not always the case as there are times that pieces could be moved to another location but in this case we were not able to do that so a classic frame was a much more timeless choice. Although this is just an iphone picture of this arrangement, you will notice that I use anti-glare glass when framing. I feel this is extremely important and if you are going with custom framing is worth the additional expense. It will allow you to see the images from all angles.